Whether your quest is to behold beautiful landscapes along the way, enjoy a tailgating shindig, fish in popular ponds, or simply the love of a road trip, traveling North America’s roadways is the absolute best way to embrace and behold all that the road has to offer. Before you head out, consider making renovations to your RV that can make your whole journey an even more enjoyable, fun, and unforgettable adventure. 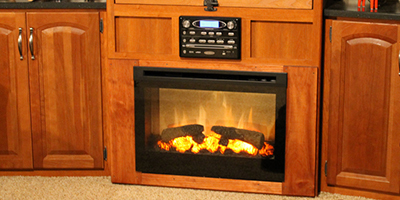 An unquestionably unique addition, as well as an appropriate and sensible investment for RV renovations, electric fireplaces can provide enjoyable visuals during relaxing leisure and keep you warm during cold weather conditions. In addition, you don’t need to wait for the flame to go out before you turn in for the evening and there’s never campfire mess to clean up when you’re ready to get back on the road! They are equipped with a small heater and a fan blower to spread out heat within the general area. Louvers on the electric fireplace enable the hot air to be directed to the area of your choosing. Additionally, an electric fireplace can be used to reduce propane expenses, as well as be used along with the propane furnace to create even more heat during freezing weather conditions. Electric Fireplace Direct suggests a free standing electric fireplace that’s designed to look like a traditional cast iron stove. These models, in particular, are popular because of their aesthetic appeal and because you can easily warm your RV’s “patio” area on a cool evening, can be easily transferred inside your RV to warm up your sleeping area, and then used in your home once you return from your adventure! Coming up with the necessary amounts of electrical power for daily function can be quite the task. Generators not only have costly requirements of fuel, but also produce noise pollution. 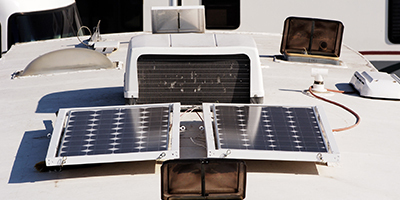 A solar-powered RV system is a quieter and cleaner option that also maintains the charges on your batteries. Solar panels can provide a 12-volt DC power when charging a set of batteries. In order to handle all of your electrical needs, Talco Electronics suggests installing extra batteries during your RV renovations in order to store additional power. After adding an inverter, which increases the 12v DC power to 110v AC power, you are able to run anything from flat screen televisions, microwave ovens, or kitchen appliances as they long as they are within the amperage rating. All items will be operated solely off the bank of batteries. Much like solar panels, wind turbines enable you to generate electrical power without burning any fuel or costing you any money. 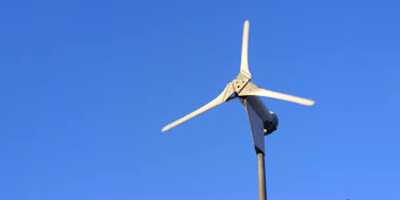 Not actually storing any power, wind turbines convert the mechanical energy of their spinning blades into an electric current. The power output increases when the wind speed does and the integrated circuitry prevents overcharging, as well as over revving. Having this circuitry also enables direct wiring to the bank of batteries. Once the batteries have been fully charged, the integrated regulator will automatically shut it down to reduce wear. Decked Out RV Products shares lots of unique ideas for slide out decks that can withstand seasonal weather and resist corrosion. An included hand rail can help you climb up onto the deck from the attached step, and the deck can also keep you out of the mud and dust. 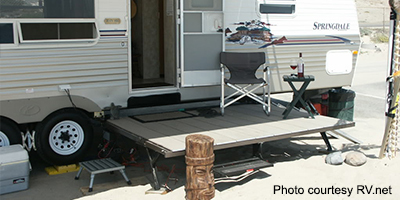 A slide out deck has enough room for you to sit in a level place that’s clean and dry, as well as making getting in and out of your RV much easier, without hassle. For pet owners, a slide out deck can also help your little or older dogs get in and out without any assistance. Being stowed under the RV during transit, the simple task of pressing a button once you arrive at your destination will bring it out. The possibilities for cool renovations to your home-on-wheels are seemingly endless. However you decide to improve and enhance your RV, you’ll want to first make sure any changes or renovations keep your RV roadworthy. Just like a home in suburban America, your RV ought to reflect your personality and uniqueness.